While this piece is richly decorated with fine open-work and relief carvings throughout; it stills retain it's 'Ming' form. During its painstaking construction stage; the framework when assembled without its carvings, reveals a chair so pure in form/proportion that it represents the benchmark for other rose chairs and even some contemporary chairs. The inclusion of intricate carving harmonises the basis form to produce a classic. 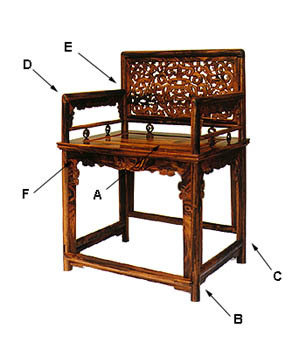 The original pair is housed in the Central Academy of Arts and Crafts, China.